There are many things in life that I couldn’t live without, and one of those things is obviously music. I hate to say it, but I kind of need it – it has served too significant a purpose in my life. Whether playing in the background while I blog or surf the web, or helping facilitate my meditative journeys into the beyond – music has been a transformative energy throughout my existence. Of course, that’s my poetic side talking – but put simply, music is awesome, and everyone loves it. I would say my love for music really started to take root when I got my first portable CD player in middle school. Having one of those gave me control over the music I wanted to listen to the for first time – for years I was limited to the occasional spurts of Radio Disney or KS 107.5 in the car, when my family would let me listen. I got into various genres, ranging from alternative rock, to pop, to hip-hop and techno. My adolescence was a prime time for musical exploration. I remember when MP3 players became a thing - I was one of the first kids at school to get one, and it completely changed the game. I had even more control over the music I owned - having freedom to search, download and play an even wider variety of songs at any given time. Through high school and college, I was a huge proponent of Apple iPods - from the color, to the mini, to the touch. Through that time I found my taste in music become more focused, narrowing in on specific genres and artists that truly resonated with my soul. But enough background on my love and experience with music, let's get into the present. With technological advances, artists have been able to produce incredible new tunes and sounds. Hence why this blog is being covered within the Digital realm of things. While I will always appreciate the true talent associated with playing instruments, I have become increasingly interested in more synthetic creations - House music specifically. I love how creative DJs and producers get with music - they create some very refreshing remixes of classics and current hits, as well as original tracks of their own. My music listening primarily takes place on my phone these days, and using YouTube as my platform of choice, one of my favorite channels to listen to is Futurism. This channel features songs all within the House music genre. The video images help convey the emotion of the songs, setting the mood for listeners as they get drawn into the various Houses that stream through their playlists. Now, many people look at this music as just a bunch of noise of repetitive tones, but if you listen closely and allow yourself to absorb the rhythm, you will be surprised by the journey that this music can take you though. I don't know, I'm just completely here for this genre. You can dance to it, vibe to it, meditate to it, work out to it, the list goes on. There are countless House channels, sub-genres and artists - and I find myself discovering new brands every week. I invite you to enter House for a unique and one-of-a-kind experience sometime soon. While still a fairly overlooked genre of music by people in the U.S. - K-pop has made some significant strides in awareness over the past several years. I remember when I first discovered it in college - I was looking around YouTube when I saw this video of a Korean girl group called Girl's Generation that had over 10 million views. Featuring one of their classic hits called "Gee", the video was a dance version where they performed the complete choreography of the song. I was captivated by how synchronized and well coordinated their dancing was, and it sparked my curiosity as to the rest of their music, as well as other groups within the genre. The rest is history. Since then, I have become a full fledged fan of various groups - especially as the genre has continued to evolve. Similar to House music, I love how creative the producers get with the songs - there are some very original blends of instrumentals and synthetic tunes that make for incredibly infections and unforgettable music. Take the music video above for example - "Bboom Bboom" by Momoland has one of the most catchy sounds I have ever heard, and it has quickly become one of 2018's most popular K-pop songs to date. And who can resist the super fun choreography? I try to get my peers into the genre as often as I can - but I have a feeling with groups like BTS quickly infiltrating the U.S. market, it won't be long before we see a large American fanbase. I don't even think I want to know how much money I've invested in headphones over the years. Being a heavy music listener, and someone who tends to be hard on my equipment in general, I usually have to get a pair of new headphones every 3-6 months. They're either too cheap and fizzle out fairly quickly, or I accidentally strain the cord too much and the internal fibers get broken. Needless to say, an annoying recurring investment I have to make - which is why I have been especially interested in getting wireless headphones. I don't have an iPhone, so those cool earbuds that everyone is walking around with these days aren't exactly an option - though there are companies that sell something similar. But I didn't have to worry about this for too long, because about a month ago, I had this interesting brand by the name of Symphonized reach out to me. They're a unique headphone and speaker manufacturer that leverages hand-crafted wood to reinforce the acoustics played through their products. They very generously offered to give me a pair of their Wireless NRG Sport Bluetooth Earbuds and a NXT Bluetooth Portable Speaker in exchange for a little bit of social love. Their timing couldn't have been any more perfect, and having had a few weeks to test these products out, I'm excited to share my POV. As you can see from the smile on my face, I could not be more smitten with these new earbuds. It has me wondering why I didn't ditch the standard headphones sooner - these things have changed my life. I feel like I have been liberated; there is just so much more freedom in not having to worry about an annoying cord getting in your way while you're listening to music. Can have my phone sitting in my backpocket, or on my desk while I step just a few feet away to grab something - or even leave my phone sitting on my bed while I dance around my apartment. I am literally never going back to regular headphones again. The sound quality is incredible with these earbuds; it may very well be the wood that helps facilitate smooth and quality sound. While they do not completely drown out nearby noise, they come pretty darn close, and without having to turn your volume up too high to do so. The only minor negative feedback that I have is that you have to keep them well charged, especially if you're using them consistently. But it's not the end of the world - just carry a USB charger with you and plug them in when you get the "Battery Low" prompt. 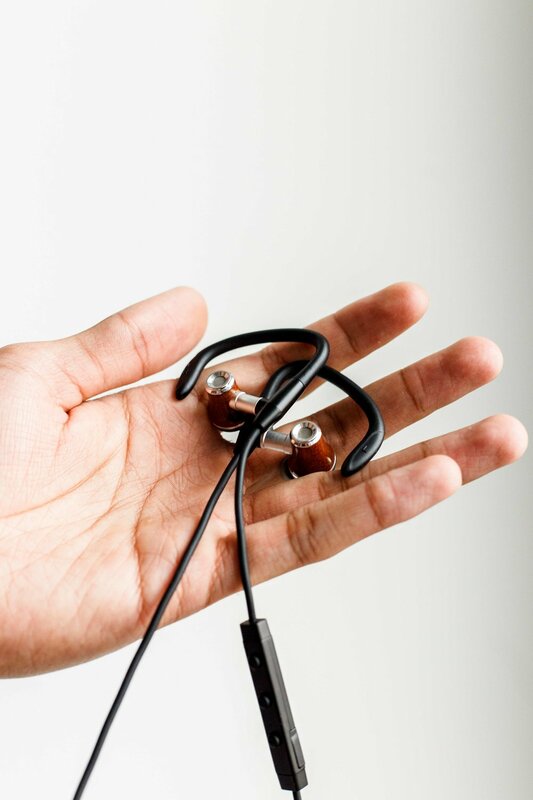 They also charge fairly quickly and are decent in holding a quick charge, so you won't be disconnected from your music for too long. With all of that said, highly recommend you get a pair of these NRG Sport Bluetooth Earbuds ASAP. To be honest, while this speaker is great quality, I don't personally have much use for it. For the sake of reviewing the product, I did try it. I must say, the sound that come from it is sharp and pure. So pure to the point where I don't recommend standing next to it because the concentration of the sound feels like it's piercing your ears on a subtle but deep level - in a good way but you don't want to go deaf from the intensity. The speaker is able to fill the space with strong volume at just a moderate level, so perfect for people who have regular group gatherings - both indoors and outdoors. As I'm sure is the case with many portable speakers, it has to be plugged into an outlet or laptop in order to function. I personally would be a bigger fan if it was a wireless speaker - but since I usually roll solo, that's where earbuds come into play I guess. So long story short, if you wouldn't mind dropping a few extra dollars on a genuine quality portable speaker, I don't think you'd regret getting one of these. I think we learned a lot here - I had intended this to really focus on my brand collaboration with Symphonized, but I think providing context on my relationship with music throughout my life helped tell a stronger story. Looking at music as a form of technology is an interesting concept, and pairing that with the physical technology that we use to facilitate that experience helps validate that perspective. But as always, that is just my Xperience - we all experience things differently. As great as wireless earbuds are, I am already thinking ahead as to how that technology will evolve. Music implants anyone? Scary and intriguing at the same time, but I'll try not to get too caught up in the future. For now, I'm just happy listening to K-pop while I dance like no one's watching.